The state food and supplies minister was returning from Baran after an event at 1 AM when the car hit a stray buffalo and then rammed into a divider. Babu Lal Verma has been admitted to the ICU of Maharao Bheem Singh (MBS) hospital. Kota: Rajasthan minister Babu Lal Verma was injured while his personal assistant was killed when his car hit a buffalo and overturned on the Kota-Baran Highway early today, police said. 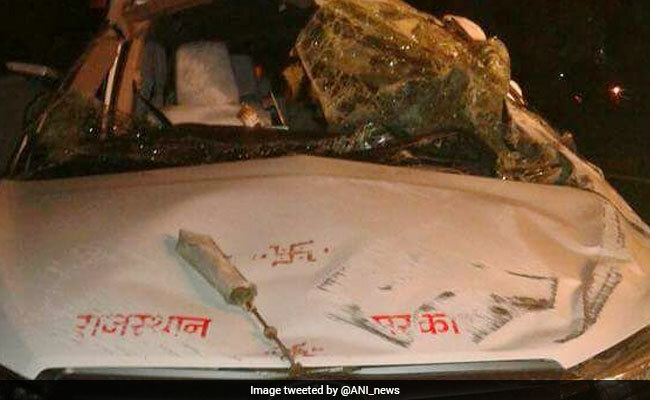 The car driver, Moti Lal, was also injured in the accident, they said. Mr Verma has been admitted to the ICU of Maharao Bheem Singh (MBS) hospital. He sustained injuries in his knee and chest and was referred to Jaipur for treatment. The state food and supplies minister was returning from Baran after an event at 1 AM when the car hit a stray buffalo and then rammed into a divider before turning turtle near a flyover, Semliya Police Station SHO Banwari Lal said. They were immediately rushed to the hospital where the minister's personal assistant, Rajendra Pradas Rager (43), a resident of Baneta village, was declared dead, the SHO said. Head of Department, Neurology, MBS hospital, Vijay Sardana said, "The minister sustained injuries in his right knee, right foot and right side of chest. He is medically stable and out of danger." On the request of family members and directions of Chief Minister Vasundhara Raje, Mr Verma has been shifted to Jaipur for treatment, Mr Sardana said, adding his driver has also been shifted.